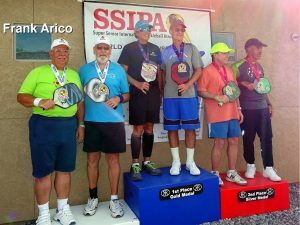 Frank Arico (our Club Treasurer) recently attended the Super Senior International Pickleball Association (SSIPA) World Championships held on the 23rd and 24th October at the Robson Ranch in Denton, Texas. The Tournament was played outdoors where the facilities and the weather were both excellent on the first day. Frank was partnered by Ian Wilson (Pickleball Club, Oxfordshire) and together managed to win a Bronze Medal in the Men’s Doubles, age Group 65-69 in the 3.0 division. The Mixed Doubles play had to be switched indoors due to the torrential rain caused by the fringes of a passing hurricane. Frank teamed up with an allocated partner and they were knocked out in the third round by the eventual Gold Medal Winners. The tournament was characterised by great facilities, good organisation, friendly people and a high standard of play.